The drifting of remaining teeth: drifting usually effects the teeth that are adjacent or opposite the site of your missing tooth. This often occurs after a tooth has been extracted, where there is a gap for your remaining to move into easily. Teeth can drift sideways, or can tip into the area left by a missing tooth. Regardless of whether your teeth drift sideways or tip, the movement causes long-term problems, making your teeth become more prone to gum disease and root exposure. 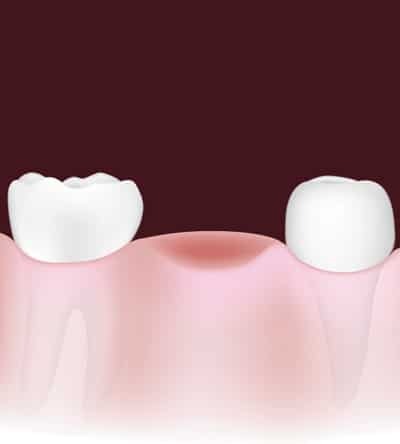 Bone loss: this occurs at the site of your missing tooth, when the root of your tooth is no longer connected to your jawbone. Without the root of your tooth, there is no need for your body to maintain bone density to keep the roots in place. As a result, the jawbone resorbs and shrinks away over time in both height and width. This makes installation of a replacement implant very difficult; bone grafts might even be required, which although an acceptable procedure, adds to the cost and complexity of implants. If left untreated, both of these conditions will worsen over time, and can begin to affect all of your remaining teeth. Missing teeth can be both a hindrance and an embarrassment to your daily life. They can restrict the type of foods you are able to eat, and leave you reluctant to smile properly. dhealth Dentistry Camberwell is well versed in all teeth replacement procedures. Conventional Dentures: these are removable, plastic teeth replacements that can be used for some or all your missing teeth. Fixed Bridge: we can use bridges comprised of either gold or porcelain materials to permanently fix a new tooth between two existing, good teeth. Dental Implants: these require inserting a fixed pin into your jawbone, with a porcelain crown attached. Prevent drifting: by replacing your missing teeth, you prevent your remaining teeth drifting into the gap that is left behind. Prevent bone loss: if your tooth is replaced with an implant, the bone loss process is halted; the bone re-mineralises around the screw of your new implant. Please note that this is not the case if you opt for dentures. Restore your beautiful smile: by replacing your missing teeth, you rid yourself of the unsightly gaps left behind, giving you the confidence to smile once more.